The Batu Caves are a popular and iconic tourist attraction in Selangor and a must see if you’re lucky enough to be in Kuala Lumpur. We hopped on the air-conditioned KTM Komuter train at Sentral Station and were at the caves in under an hour. The site of a Hindu temple and shrine, Batu Caves attracts thousands of worshipers and tourists, especially during the annual Hindu festival of Thaipusam. The main attraction is the worlds largest statue of Murugan. 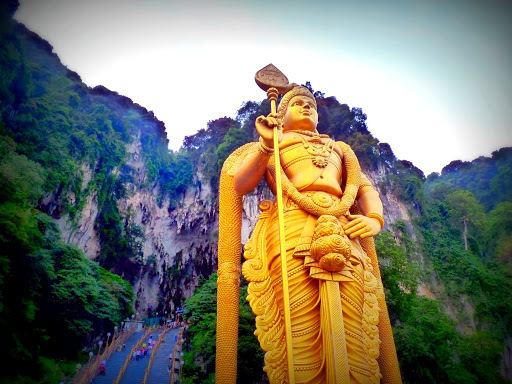 The Hindu God of war and victory rises to 142 feet tall and stands guard over 272 concrete steps leading to the Temple Cave. Of the various temples that comprise the area, the largest and best known is the Cathedral Cave, housing several shrines under its high vaulted ceiling. You’ll most likely be entertained or even harassed by a troop of monkeys that call the temple home. They make great subjects to photograph but keep your valuables tight as they have been known to steal the unwatched backpack, purse, or water bottle. We were happy to discover a public cafeteria on site serving cheap and delicious vegetarian fare, so make sure to bring your hiking shoes and your appetite.